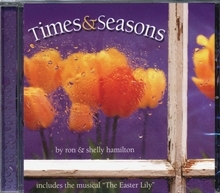 Everything you need for your church choir to present Ron and Shelly Hamilton’s Easter program, The Easter Lily, is included in our choral book, Times & Seasons. The Easter Lily is a simple-to-produce musical program with a powerful story. Requiring only six actors and about 45 minutes, The Easter Lily can help you create a memorable Easter service that will have a lasting impact on your church. But don’t put Times & Seasons in the filing cabinet after Easter! This choral book has something for special days all year long! Not only does it include The Easter Lily, but it also contains songs for Patriotic days, Thanksgiving, Mother’s and Father’s Day and more! Ron and Shelly Hamilton have made sure that all of these new songs allow your choir to participate in the theme of the occasion while still directing attention to our Lord, Jesus Christ.